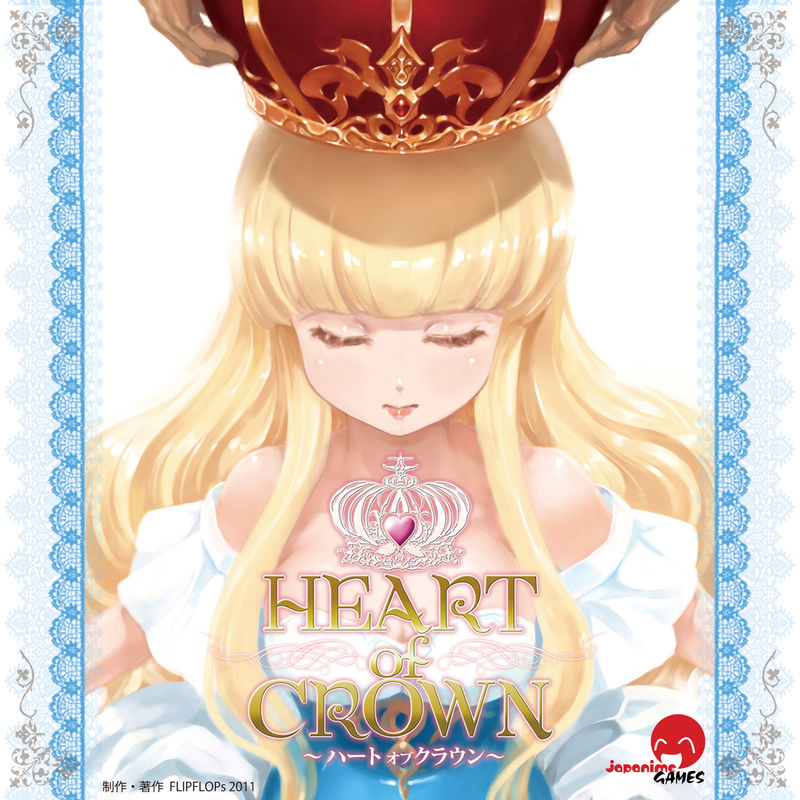 Heart of Crown is a game by gingko, published by Japanime Games. It is for 2-4 players. In this game, players will take on the role of dignitary of the great Empire. They will be trying to back one of the princesses in line to claim the recently vacated throne while gaining support from across the nation. If they can do this, they will bring peace and tranquility back to the kingdom and thus be declared the winner. To begin, the 6 Princess cards should be placed face up on the table in a row. A number of Curse cards are set in a pile equal to 4 times the number of players. Each player is given a starting deck of 7 Farming Villages and 3 Apprentice Maids. Their deck is shuffled and placed face down in front of themselves. The Basic Market is set up near the Princess cards with each card type placed into a separate pile. 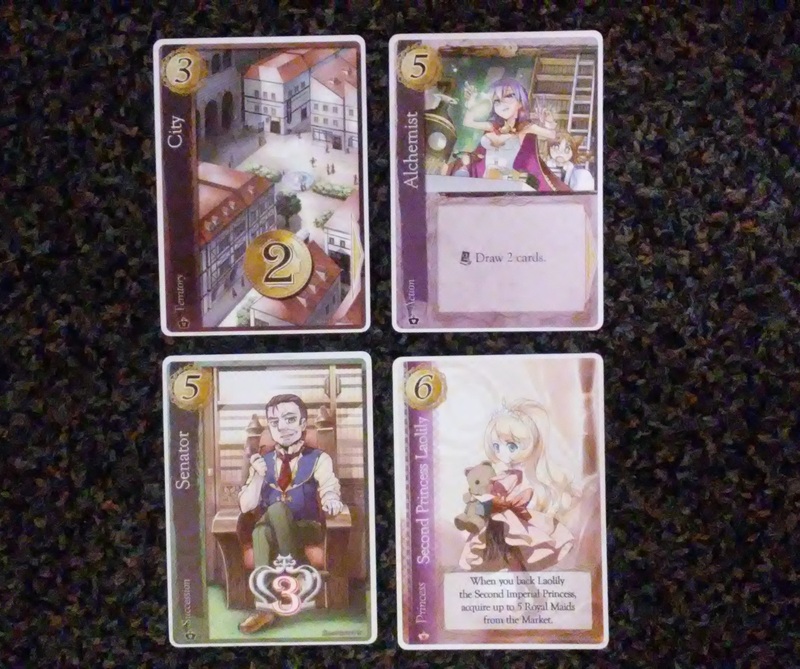 The Basic Market consists of City, Large City, Royal Maid, Senator and Duke cards. The Supply pile is then set up using a selection of 10 of the Common Card types included in the game. This can either be done randomly or by choosing one of the recommended card sets. If this is the first time playing, it’s recommended to use the Scout, Wishing Well, Post Horse, Trading Ship, Government Contractor, Supply Unit, Library, City Development, Adventurer and Alchemist. The Common Cards, along with the 2 Rare Cards (Imperial Capital and Imperial Crown) are shuffled together and placed face down near the Basic Market. Cards are drawn from the Supply Deck until there are 8 different card types face up on the table. Any duplicate copies are stacked on top of each other. This is known as the Random Market. Each player will now draw the top 5 cards from their deck. The first player is chosen and play now begins. The game is played over several rounds. Each round players will take a turn consisting of 5 phases. The phases of a player’s turn are Main phase, Second phase, Cleanup phase, Draw phase and Market Refresh phase. The first phase is the Main phase. In this phase, the player may play an Action or Territory card face up into the Field. Once the effects on the card are resolved, the player’s main phase is finished. That is unless the card that they played had a link symbol on either the right or bottom of the card. In this case, the player may play another card. If the card has both symbols, they player may play 2 extra cards. This may continue as long as the player plays cards with link symbols on them. Once the player runs out of linkable cards, cards in their hand or chooses not to play any more cards, the phase is over. It should be noted that once a player has backed a princess in their Domain, they have two extra actions that may be taken during the Main phase. They may take an Action card from their hand and place it on top of a Territory card in their Domain, thereby keeping the card for future use. However the card that is being kept may not have a greater cost than the Territory card that it’s being placed on. More on all this in just a bit. The player may also recall a card, returning it from their kept Territory cards and placing it back into their hand. The second phase is oddly enough, the Second phase. In this phase, the player is allowed to perform 1 of 3 different actions. They may buy cards from the Market, back a Princess or play Succession cards into their Domain. To buy cards from the Market, the player simply chooses a card or cards from the Market and pays the cost in coins using any coins that they gained during the Main phase. Any cards bought are placed in the player’s discard pile. To back a Princess, the player must pay 6 coins to place one of the Princess cards of their choice into their Domain. The player must then take 3 Territory cards that they played during their turn with the highest cost and move them beside their Princess into their Domain. It should be noted that a player is only allowed to back 1, and only 1, Princess during the game. If they already have a princess in their Domain, they may not choose another. To play a Succession card in their Domain, the player must first have a princess in their Domain. They may then choose to play as many Succession cards as they would like from their hand, into their Domain. These will not be discarded and will count towards their point total. The third phase is the Cleanup phase. In this phase, the player moves any cards that they played during their turn, as well as any cards remaining in their hand, into their discard pile. Cards placed in the player’s Domain, do not get discarded. Any unused coins gained during the turn are also discarded. The next phase is the Draw phase. In this phase, the player will draw 5 new cards from their draw pile to start their next hand. If their draw pile runs out, they will shuffle their discard pile to create a new draw pile. The final phase is the Market Refresh phase. In this phase, the player checks to see if the Random Market has 8 different types of cards. If it doesn’t then they will draw a card from the Supply pile to fill the empty spot. If it’s a different card it’s placed in the Random Market, if it’s not, then it’s placed on top of the stack that is already there and a new card is drawn, just like was done during setup. If at any point, the Supply pile runs out, then the game continues without any new cards added to the Random Market. Once this has been completed the player’s turn is over. Play passes to the next player in turn order. The game continues until on a player’s turn, they have a total of 20 Succession points in their Domain. When this happens, the player can declare a coronation ceremony. All the other players are able to take their turn as normal. If no other players are able to declare a coronation ceremony, then the player wins. If other players were able to get the 20 Succession points on their turn to declare a coronation ceremony, then the game goes into sudden death overtime. Any players not able to declare coronation ceremonies are out of the game. The remaining players will continue the game until one of them is able to reach 30 Succession points. The player that does this is able to place their Princess on the throne and is the winner. Another way the game can end is if there are no more Duke, Senator and Royal Maid cards left in the Basic Market. When this happens, the game ends immediately. The player with the most Succession points is the winner. This game comes with a pretty large stack of cards. Each one has a beautiful anime style image on it. I especially like the full images on the various territory cards like the Farming Village. These look like an opening scene from an anime movie. The princess cards and several of the others, like the Apprentice Maids, have some great looking character designs on them. My daughter is a big fan of the Princess cards, as I expected her to be. The game also comes with randomizer cards and thick cardboard dividers, as well as some foam to keep everything from moving around too much inside the box. There are also a bag full of various counters to be used during the game. Some of these are for the expansions but were included with the main box anyway. These are really thick and have a nice looking design. The box itself has plenty of room for all the cards from this and both expansions. It will even fit all the cards if you choose to sleeve them. There’s not a lot of iconography on the cards so there’s nothing difficult to remember when playing the game. I love the look and design of everything including the box for this one. Overall it’s well designed and looks amazing. The rulebook for this game is a bit unlike any of the previous deck builders from Japanime games. For starters, everything is in color. There are lots of pictures throughout the book, as well as a bunch of examples of gameplay. There are a couple of pages devoted to explaining the different types of cards and what each item on them is and does. Each type is completely detailed. There’s a section for the few symbols in the game, as well as many of the terms used in the game. There’s a great setup section with beautiful pictures included, as well as a step by step explanation of a player’s turn. The book also has sections for several other rules that may come up while playing the game and a place for frequently asked questions. In the FAQs, they’re broken down by card type and name for ease of reference. There’s also a section of variant rules for 2 player games, Hand Elimination and the Guardians variant. The book even has a section of recommended card sets for setting up the game for first time players to intermediate, as well as several themed sets. Overall the book does an amazing job at covering everything you need to know and providing lots more bonus stuff. This is a great improvement to those previous deck building game designs. I’m very happy with this one. If you’ve ever played a deck building game like Dominion or especially one of those from Japanime Games like Dynamite Nurse, then you’re pretty familiar with the basic ideas and concepts of how this game works. There are, of course, a few minor differences but the basics are all pretty much the same. Where this game differs is the links on the cards. You’re only allowed to play 1 card on your turn, but if it has a link on it then you can play another. If that card has a link, you get to repeat the process. If it has 2 then you can play 2 extra cards. The idea is that far removed from Dominion. With this game you’re trying to build up your Domain with plenty of Succession points. If you’re able to get 20 of them before your opponents then you win. Simple as that. Of course, there is a bit more to it than just that. I mean, you’ll be playing some attack cards which the opponent can defend if they have a defense card. This is one aspect that I didn’t cover in the overview, but it’s pretty simple stuff actually. If you’ve got a defense card then you can defend against an attack, if not, then oh well you just get stuck with it. I like how the cards work together and if you get your deck running just right you can make magic happen. Of course my daughter loves the princesses. She loves building her Domain. Of course the main problem for her is choosing exactly which princess to back, cause they’re all beautiful to her. Needless to say, we really enjoy this one. Fans of deck building games, especially those with an anime style like Dynamite Nurse or Tanto Cuore, will really enjoy this one. I’d say that Dominion fans will feel right at home with this one and will like it as well. I would highly recommend it. It’s definitely one of the best deck builders I’ve played. Heart of Crown is a deck building game of royal succession with an anime style theme. It’s not a very long game. Most game sessions last around 40-45 minutes, give or take. The artwork on all the cards have an anime style that looks gorgeous. Each design is really beautiful. My daughter loves the princess and I like the territory cards. The game is fairly simple to play and is one that the whole family can enjoy. There’s not a lot of iconography or other stuff to make things difficult like in so many of these style games. Players familiar with Dominion or Tanto Cuore should find this one easy to learn. Fans of those or other deck builders should really enjoy this one too. Anime fans will like the look and theme of the game. My daughter and I enjoy getting our princess to the throne in this one. It’s a great deck builder and one of the best ones that I’ve played. I highly recommend it. Let the coronation begin! This entry was posted in Reviews and tagged board, board games, card, card games, crown, games, gingko, heart, heart of crown, japanime, japanime games. Bookmark the permalink.